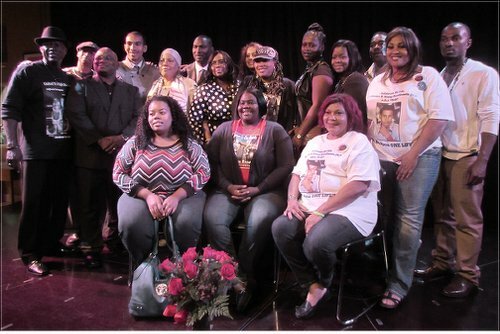 Families take stage at “Cost of Injustice” meeting in Oakland, Calif. on Oct. 25. Oakland, Calif. — The “Cost of Injustice” event at the Oakland Eastside Arts Alliance was an evening of culture, art, healing and unity. This was a union of families whose children have been killed by the police or by Black on Black violence. The Oct. 25 program started with libations, calling out the names of those whose shoulders we stand on and those whose lives were stolen by police violence, followed by poetry, spoken word, drumming, dance and music. One of the many highlights of the program was when Cephus Johnson — “Uncle Bobby” — the uncle of Oscar Grant, Beatrice Dale and Elaine Brown took the stage. Dale called out the names of the parents of Ernest Duenez, Mario Romero, James Rivera and Oscar Grant, representing a few of the many families in Oakland whose lives have been stolen by the police. He also welcomed the parents of Kendrick Johnson of Georgia, and Marlon Brown and Jordan Davis of Florida. There was also a representative from the Minneapolis-based Emmett Till Legacy Foundation who spoke for the family of Emmett Till. The parents from Florida and Georgia shared their stories with the families of Oakland. Dinyal New, the mother of two sons who were killed within two weeks of each other — both victims of street violence — shared her story. Other speakers included former Black Panther Elaine Brown; psychologist and historian Dr. Wade Nobels; and Julius Edwards, a frontline soldier from Ferguson. At the end of the program the families gathered together for a group picture.